Keratosis pilaris is seen most commonly during childhood and presents as small, rough, raised lesions that are called papules. 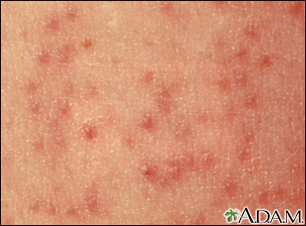 These papules are described as spiny and keratotic and are typically skin colored. The papules are usually found on the outer surface of the upper arms and thighs, although it may occur elsewhere on the body. The roughness is accentuated by dry skin and the condition is often worse in the winter. It tends to be inherited and may be associated with atopic dermatitis.